Cubbies and drawers galore make for an excellent clutter solution! Our Amish Roll Top Desk is Deluxe in every way. Handcrafted in the heartland, you will be impressed by the made to order details that are present in every inch of this Amish desk. Carved to perfection with your office in mind, no corner will be cut in the construction of your made to order desk. Customize the look of your Amish roll top desk by choosing your favorite wood types and stain. We offer oak roll top desks, cherry roll top desks, walnut roll top desks, hickory roll top desks, maple roll top desks, and of course quarter sawn white oak roll top desks. 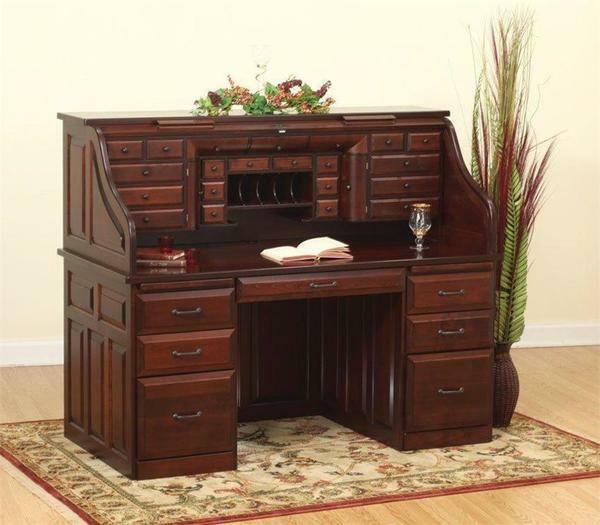 This Deluxe Desk is an heirloom quality storage haven and will make enjoying a clean workspace a cinch! This Old Order Amish Deluxe Roll Top Desk has dovetail drawers with full extension slides that have a weight capacity of 100 pounds. The rolltop desk drawer bottoms are solid oak plywood and offer plenty of room for all of your office essentials. This Amish rolltop desk is handmade in the solid wood of your choice with a 1" thick frame. It is sure to communicate professionalism and durability in your home or office! Take your American made desk to the next level by selecting the hardware of your choice. Another customization option to consider is adding drawers on top of the desk, which will increase the height by 4". We also offer the option for a raised panel solid wood back, locks on the drawers, secret compartment options, as well as black accents. Please get in touch with us to discuss all of these options and more for the Deluxe Amish Roll Top Desk: 866-272-6773. Height with Drawers on Top: 55 ½"
I received my roll top desk today. The picture on your website does not do it justice. It is beautiful! I've always wanted a big, well-built solid wood desk, but have never been able to find what I wanted. This desk is it!! I am so proud of it. Garry, the delivery man was so nice and got it here without so much as a scratch on it. As heavy as it is, that was an accomplishment in itself. I just can't say enough good things about the craftsmanship, the service, and communications I received. I am a satisfied customer and I will check your site first for any future needs I have.